There’s an extended chase sequence near the end of The Adventures of Tintin that follows multiple characters and creatures throughout an entire town, and it is all presented via one long extended take. In live action this shot would have been impossible to do, and if Tintin will be remembered for anything, it will be for that shot. Director Steven Spielberg uses the motion capture technology that has been developed by Robert Zemeckis and James Cameron to dig deep into his creativity and to deliver a non-stop thrill ride, climaxing with that shot. I saw this film in IMAX 3D, and this sequence in that format rocked me to my core. Unfortunately, not much else in Tintin had as great an affect on me. I’m only marginally aware of the European journalist, so while his exploits are new to me the rhythms of his investigation into a lost ship and the possible treasure the wreck holds are not. If you’ve seen an Indiana Jones picture, you’ve already seen Tintin, and you’ve seen it done better. The notable exception to this underwhelming feeling is the aforementioned shot and the fact that motion capture technology has finally delivered on the promises Robert Zemeckis made with The Polar Express nearly a decade ago. Weta Digital delivers characters and settings that are practically photo-real, and not once did I actively think “this is motion capture.” While watching Polar Express or Beowulf I couldn’t get the image of Tom Hanks or Ray Winstone in a skintight blue suit out of my head. That thought never crossed my mind while watching Tintin. The film isn’t remarkable for fans of the adventure genre, but it is remarkable for fans of film. Years from now, they’ll be showing this to film students just as they show A Trip To The Moon and Citizen Kane. Andy Serkis (who seems to be setting himself up as the Lon Chaney of motion capture) provides the heart of the picture, and to be quite honest its more his story than it is Tintin’s. Serkis’ Captain Haddock has an actual stake in the outcome of this adventure (unlike the titular character) mostly involving unfinished business with family enemy Sakharine. Sakharine is played by Daniel Craig, and it amazes me that he can give such a dull performance in the flesh in The Girl With The Dragon Tattoo and deliver such a lively one here while hidden behind Weta’s animation. Craig is acting in Tintin. In Tattoo he’s collecting a paycheck. The star of the film isn’t either of them, however, and nor is it Jamie Bell’s Tintin. No, the star of the film is Tintin’s faithful pup Snowy, who is clearly smarter than his master and more spirited and spunky to boot. I would watch an entire film with Snowy as the main character. He’s always sniffing around and up to something amusing on the sidelines, and I kept wanting the camera to drift in his direction. Instead, that camera goes everywhere it damn well pleases, and you can feel the joy in Spielberg as a director leaking back into him. His last film, Indiana Jones and Ugh, Jesus, Why? depressed me, and by several accounts it kind of depressed him too. The motion capture technology has given him new life, and his playfulness and inventiveness as a filmmaker is back in full force here. I haven’t seen War Horse yet, but I’d wager his live action filmmaking has been kicked up a notch as well. The Adventures of Tintin isn’t Spielberg’s finest film. It isn’t even close being one of the best films of this year. But it is the equivalent of a well made cup of hot chocolate. It’s warm and inviting, and it’s been crafted by a man who knows exactly what he’s doing and has fun doing it. It won’t change your life, but that’s an unfair expectation to hoist upon a movie. It will entertain you, it will cheer you up, and in these unpleasant, chilly times who couldn’t use a nice, warm drink? The Adventures of Tintin is now playing in IMAX 3D and regular theaters everywhere. 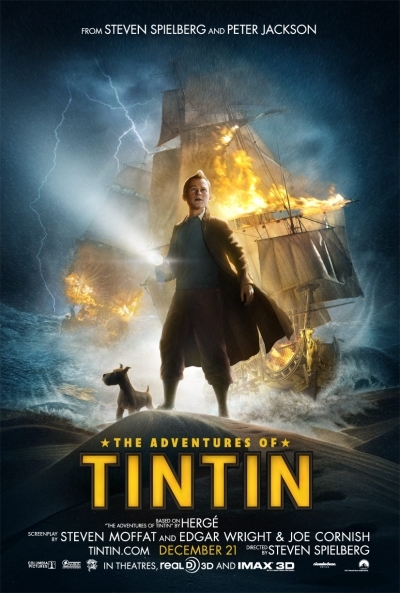 Comments for Review: “The Adventures Of Tintin” Brings Spielberg Back To Form are now closed.